Do you love cartoons? Would you like to learn how to draw your favorite cartoon characters, or create your own? Then this article is for you. In order to draw well cartoon graphics, you need to be familiar with real human anatomy, then by distorting it, you’ll be able to draw funny cartoon characters. Besides, the cartoon characters are painted in outlines, and drawing of all details as in reality is not required. 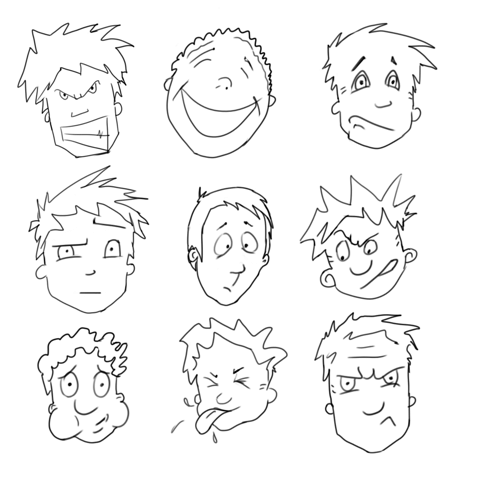 But drawing cartoon characters is very complicated due to their dynamic facial expressions. So when we are drawing cartoon characters, it is important to follow a few basic rules. First of all, try to make eyes, eyebrows and lips more expressive. After all, it is necessary to convey the mood of the hero, as we see him on the screen and in the picture. But let’s better learn to draw cartoon characters step by step! Let’s start with the head. In comics, caricatures and cartoons the character’s head can have different shapes: it can be round, oval, rectangular, triangular, and even cylindrical. The head is divided into two parts – the eyes and the jaw. And the centerlines passing through the eye area back up placing other facial features. Nose – is a central part of the face, the face is always turned to the same side as the nose. The line of eyes can be lowered or raised. If you put it a bit lower, you’ll get more space for drawing big eyes, which is very effective in representation of young female characters. However, if the eye line is defined, you can’t change it when portraying the same character in other positions, otherwise it will be unrecognizable. When creating an image, additional details such as hair and a hat for women, mustache and beard for men play an important role. Remember, you must start drawing from the basic shapes, and then add details. The hardest thing, but perhaps the most interesting, is to portray emotions on the character’s face. After all, it is the emotions of the cartoon character that animate him, make him remarkable, good or bad. When depicting emotions, you need to remember that facial expression is created only with eyes and a mouth, rather than with the shape of the head or haircut. Learn to convey emotions will the help of the mirror. Look in the mirror and try to change the expression of your face, and then try to draw what you have seen and remembered. Experiment and you will create unique facial expressions for your character. Use simple lines that show the basic outlines. After you’ve done with the head and face, draw the body. Torso of the animated cartoon characters should always be visually simple to instantly draw the eye. Usually a rectangle is used for showing a thin tall figure. Two circles one on another are used to show a plump figure. A pear-shaped form is another very useful form. You can use it to draw both young and old figures, average and fat characters. Experiment with different shapes, and you’re sure to find something that is more appealing to you. Do not forget about the clothes for your character. Clothing is drawn in the last minute. Choose clothes, depending on the nature of the character. When showing motion, do not forget about the main line of motion. This supportive line is a continuation of the spine, it shows the direction in which the whole body is tilted. This line helps to create more vivid and carefree poses. Another important part of the cartoon character after the face – it’s his hands. It is with the help of hands, you can more vividly convey the image of the hero. Cartoonish hands differ from real hands in that they have four fingers instead of five, it’s because it is easier to portray different hand positions. And it’s not necessary to draw all the details and joints; the main thing here is to sketch a contour. Usually drawn hands resemble more inflatable than real hands. To learn to portray hands well, it is necessary to study your own hand. Watch your hand, study all its natural movements, finger positions. Well, the only thing left is to draw legs and the figure is ready. The legs are usually presented in the form of two parallel lines or tubes that bend and unbend. Remember that the greater is the distance between legs, the more massive is the figure, and in general, less realistic it is. 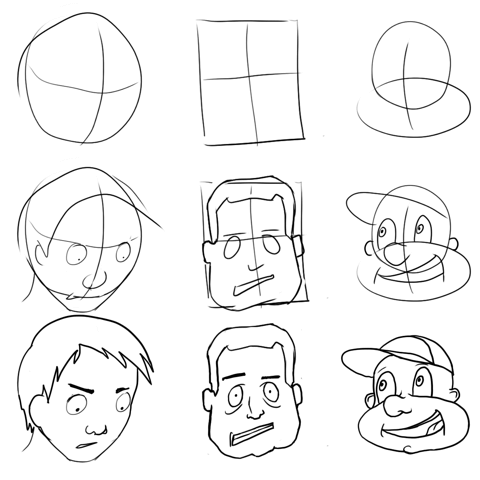 Here are the basic principles of drawing cartoon people. By experimenting, you can create your own images. Just be courageous. If you want some more practice in drawing your favorite characters step by step, the drawing application for your tablet “How to Draw – Easy Drawing Lessons” will help you in that. You need to run the application and choose any cartoon character, and then following steps of the instruction, you will be able to work out all the tricks to create a cartoon image.